Look out Netflix! Just when the convenience movie giant thought that they were making a rebound from their ‘Qwikster’ faux pas, they now have a new and formidable competitor. 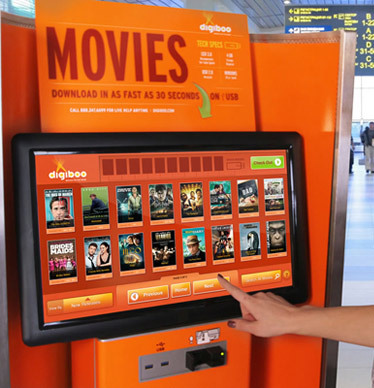 Redbox can get in the same corner as Netflix, because the new movie rental kiosk, Digiboo, is projected to give both businesses a run for their money. Granted, Digiboo’s rental service is just out of the gate with their first kiosk being placed in the Minneapolis-St. Paul Airport. The company anticipates that kiosks will soon pop up in Portland and Seattle airports as well, and then perhaps thousands of other locations. With a theme of “movies on the move”, Digiboo is being geared initially toward folks who might need entertainment on long, WiFi-less flights. It is a little different from the above mentioned forerunners in the movie industry because it is using USB technology to provide an old, yet new service. The way that it works is pretty simple, once the consumer sets up an online account. More or less, all that is required to complete the rental is a USB drive that has at least 50MB of free space available and a credit or debit card. Browse, choose a movie (one of about 700 titles), pop in the USB drive for download (which takes from a few seconds to a couple minutes) and pay (four bucks for a two day rental, or fifteen bucks to own). That is it, friends! Don’t worry at all about how to ‘return’ the selection because it will automatically expire after 48-hours from the moment that it is first viewed. There are a few glitches, though. Mac users are out of luck unless they have Windows utilities. Also, many mobile units and Androids are a no-go, although it is thought that this little issue will be rectified by June of this year. At this time movies are only available in standard definition as well. The concept is a pretty awesome one nonetheless for anyone who can attest to enduring a long flight void of entertainment. Would you give the Digiboo rental service a whirl? Do you think it will be a successful venture? Tell us why or why not. This entry was posted in Articles, Digiboo, Movies on USB Flash Drive, USB Technology and tagged Digiboo movie rental, Digiboo Movies on the Move, Digiboo rental service, Digiboo USB Drive Movie Rental Service, movie rental kiosk, Netflix, Qwikster, Redbox. Bookmark the permalink.